Canadian singer/songwriter Ben Kunder is not one to be boxed in. While discussing ‘Better Human’, his second independent release, he ventured, “I realise it’s hard to know where to put me. I just write songs and hope people relate to them…. I really just want to connect to as many people as I can in any way possible.” With such wide margins to work in you might wonder if you’re about to hear a collection of songs with nowhere to call home. That’s not how ‘Better Human’ comes across. Instead, the storytelling is the glue while the music takes inspiration from a range of sources but stays true to the Ben Kunder style. So what is the Kunder style? Breezy post-Britpop melodies set against a thumping americana backbeat basically sets Ben Kunder apart from his contemporaries, but a certain panache leads the listener down a narrow towpath, hidden alongside a well-trodden track to arrive at a destination that satisfies both the soul and the spirit. Once again, Aaron Goldstein, best known for his work with the Cowboy Junkies has been drafted in to reproduce the fireworks he crafted on debut album, ‘Golden’. Many of the original musicians have also been retained, quite rightly, having made such a stand up job first time around. Everyone will take their own particular moments from ‘Better Human,’ there is so much going on to dissect and analyze, but ‘Hard Line’ stands out with its ‘A Day In The Life’ inspired monotone piano-led chordal framework and overlapping vocal arrangements while obvious influences are scattered everywhere. Tom Petty’s southern rock roots shine through on tracks like ‘Lay Down,’ with its Hammond organ, honky-tonk piano and driving drums beneath a rich topping of soul via the contributions of his crack team of female backing vocalists, including Paper Bird Carleigh Aikins and Ladies Of The Canyon’s Maia Davies. The beautiful ‘Night Sky’ is a not entirely original album track-dedication to a firstborn child, but stands up alongside the best of them. ‘Better Human’ was written to order, while debut album and AUK favourite ‘Golden’ was the culmination of years of songwriting. 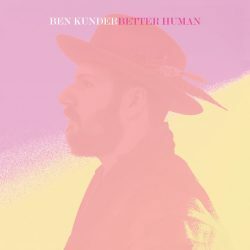 It would seem that the stars were aligned and Ben Kunder was in prime location creatively for this second release. It’s an album that reflects a coming of age: the theme of becoming the better human of the title runs powerfully throughout, alongside more sober reflections of the passage of time and the struggle to achieve contentment in a world designed to always leave you wanting more. Rock ‘n’ roll for the modern man.